Audi will launch the new generation S3 Sportback at the Geneva Motor Show next month before it goes on sale in the UK this April. 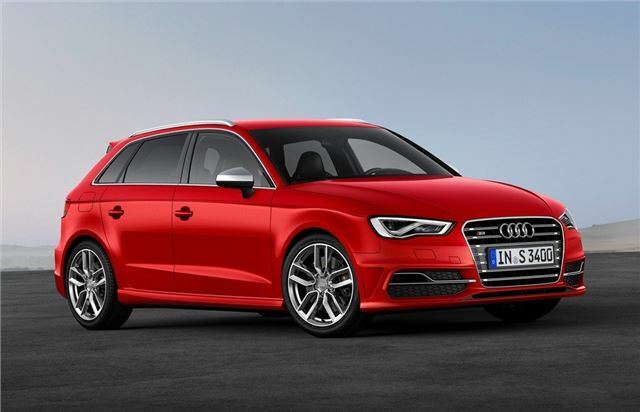 Prices will start at £34,000 - the same as the outgoing model but the new S3 Sportback gets more power and higher levels of standard equipment. It's powered by an all-new version of the four-cylinder 2.0 TFSI engine which delivers an immense 300PS in the S3 along with 380Nm of torque. That's good enough for a 0-62mph time of just 5.5 seconds with the manual gearbox while choosing the optional S tronic twin clutch gearbox sees this drop to just 5.0 seconds. Despite all that power economy is impressive at 40mpg. The 300PS peaks at 5500rpm while maximum torque is available from as low down as 1800rpm. The new TFSI engines also features a host of new technology including an innovative thermal management for faster warm-up. The exhaust system also has a sound flap that opens at certain engine speeds to produce a more aggressive noise. Not only does the S3 Sportback gets more power than its 265PS predecessor but it's also lighter by 70kg - that's the equivalent of an adult passenger. The weight saving is helped by the use of aluminium wings and bonnet. It gets quattro four-wheel drive as standard along with lowered sports suspension while Audi's adaptive magnetic ride, which can stiffen or soften the dampers, is available as an option. The S3 Sportback also comes with Audi drive select as standard which lets the driver change the characteristics of the throttle response, steering and the gear shift points of the S tronic gearbox, if chosen. Other standard equipment includes xenon headlights with LED daytime running lamps. Inside the high performance version of the A3 stands out with leather sports seats that can be changed for alcantara and leather as a no cost option. There are also optional S sport seats with integrated headrests and diamond quilting. The optional leather multifunction sports steering wheel has been redesigned with the flat-bottomed rim and in models equipped with S tronic, it has aluminium-look shift paddles.